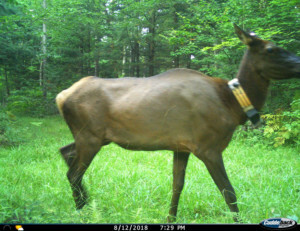 The last of the original 25 Michigan elk released in the Clam Lake area in 1995 died near Butternut in Ashland County sometime between April 8-11. It is believed cow No. 13 died of old age. She was 24 years old. A DNR wildlife technician ran a mortality check the week before on the small herd that usually travels the border of private land and the Chequamegon National Forest west of Butternut. Cow No. 13 was alive during that check. A private landowner west of Butternut called DNR Price County game warden Dan Michels the morning of Friday, April 12 to say that he found the cow dead in his hayfield. At that point, the carcass had been mildly scavenged, according to DNR elk biologist Lane Stowell. “We went out to investigate that evening,” said Stowell. “She appeared in very poor condition. There was no sign of predation. Scavangers had entered her abdomen, but otherwise it appeared that she may be one of those rare instances where a Wisconsin wild elk died of old age. She arrived with 24 other elk from Michigan in May of 1995 as a calf approaching her first birthday. The good people of the state of Michigan donated 25 elk to the good people of the state of Wisconsin in order to investigate the feasibility of restoring elk to Wisconsin. Cow No. 13’s calf was one of four calves Stowell and crew found while working his first calving season in 2001. That calf became Bull No. 91. Stowell trapped Cow No. 13 in 2006, 2009, 2013 and 2015. In 2015, the DNR took five cows and four calves from that Butternut herd, releasing cows No. 13, No. 160 and No. 256 back into their Butternut home. They moved the others, with two bulls from Clam Lake, to the Flambeau River State Forest, where the DNR had established a new herd of elk using animals brought in from Kentucky. “That group has grown over 133 percent since their arrival to the Flambeau River State Forest in 2015. They are now mixing with Kentucky elk, sharing their aggressiveness traits, savvy about wolves and bears, while the Kentucky elk share their diverse genetics. This bodes best for the future Wisconsin wild elk,” Stowell said.